Anyway, noodles were first introduced into the Philippines by the Chinese, and since then, noodles have been adopted into local cuisine with endless variations, those popular being pancit bihon guisado, pancit palabok, pancit canton, pancit habhab, etc. 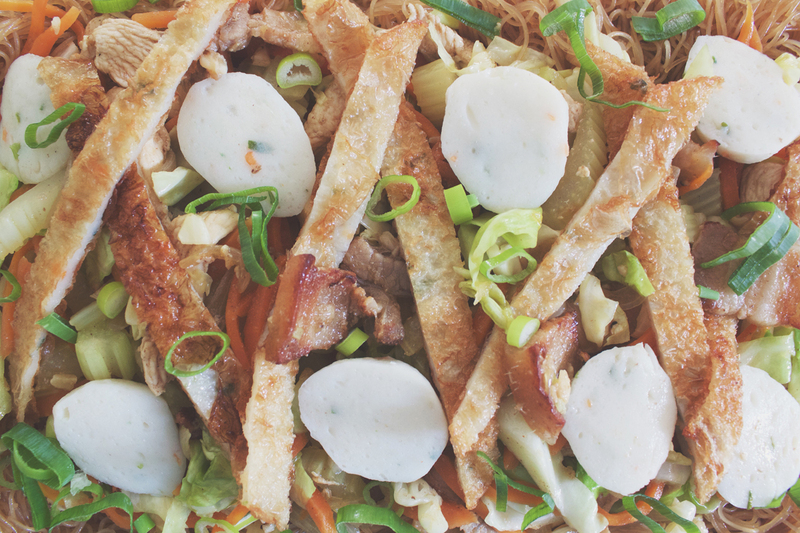 The term pancit is actually derived from the Hokkien piān-ê-si̍t (pian i sit) which literally means convenient food. 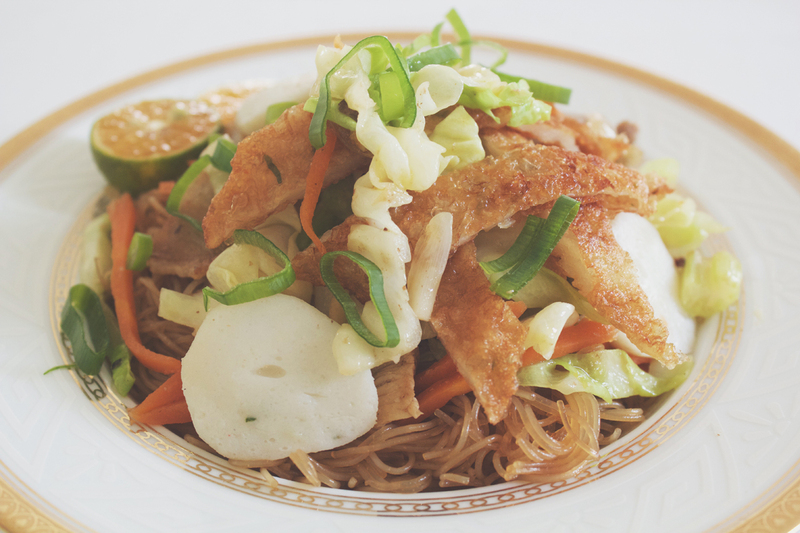 Tonight, I will be kicking it off with a noodle that has been served on our tables countless times over my childhood years up until now – Pancit Bihon Guisado! 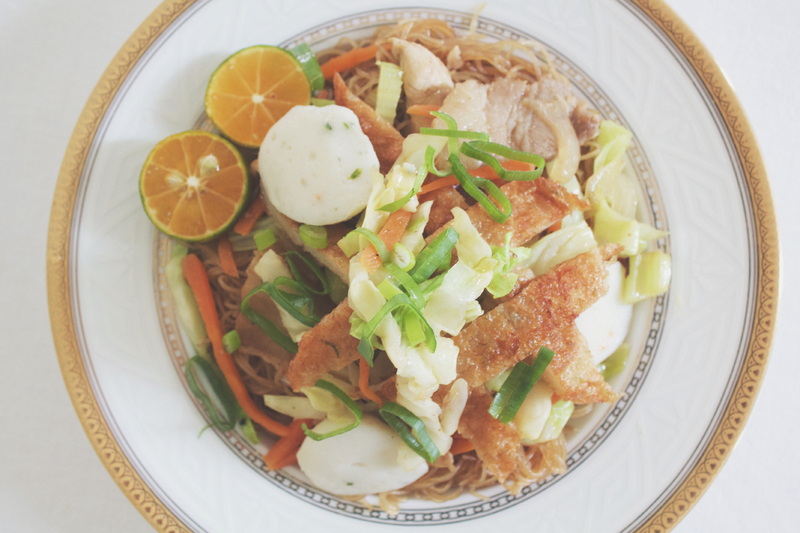 When one says pancit, it is usually associated with bihon, which is a recipe that uses very thin rice noodles, fried with soy sauce, some citrus, possibly with some fish sauce as well, and some variation of sliced meat and chopped vegetables. 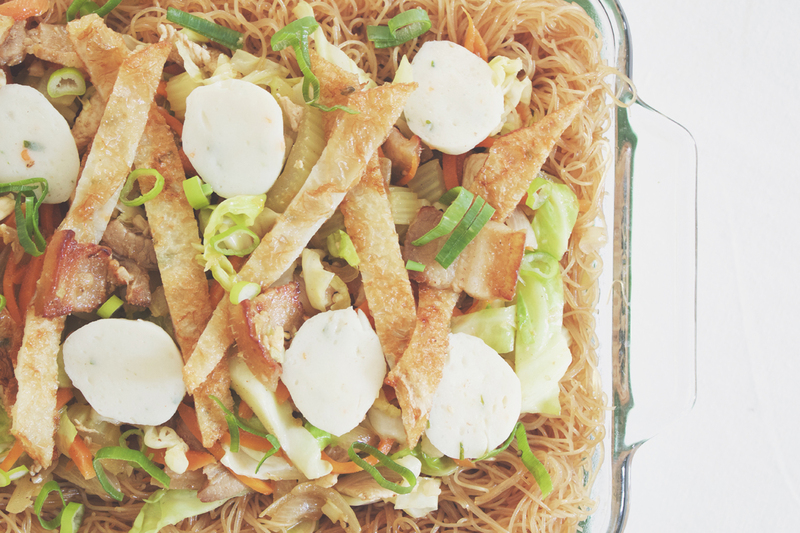 The composition of bihon varies quite a lot because it depends on your personal recipe. I can say that the recipe that I will be sharing with you today did even start out like this when my mom first made it for the family – the ingredients have definitely changed over the years! So don’t be afraid to improvise or get creative with the ingredients; s’long as you’ve got the base of the noodles covered with this recipe. You can even take all the meat out and replace the chicken stock with veggie stock for an all vegetarian pancit bihon guisado! Add the reserved chicken bone, dried bay leaves, about a teaspoon or two of whole black peppercorns, and salt to a medium-sized pot filled with about 1.5L of hot/boiling water. Turn the heat up to high and leave to boil for about 30 minutes. Meanwhile heat a large frying pan over medium-high and add in the chunks of pork belly. Cook until browned. The oils released from the pork belly should be enough to sauté the garlic and cook the onions, but if needed, add a little bit more oil if there isn’t enough. Then add the minced garlic and sauté until fragrant and golden brown, about a minute, then followed by the diced onions. Cook until soft, about 2 minutes in total. Add in the sliced chicken breasts, fish balls, and sliced fish cakes. Season with a bit of salt and ground black pepper and give it a good mix. Cook for about 5 minutes. Then add in the carrots and celery. Mix well and leave to cook for a further 2-3 minutes. Lastly, add in the cabbage and spring onions, and cook until just slightly wilted. Once done, transfer to a bowl and set aside. 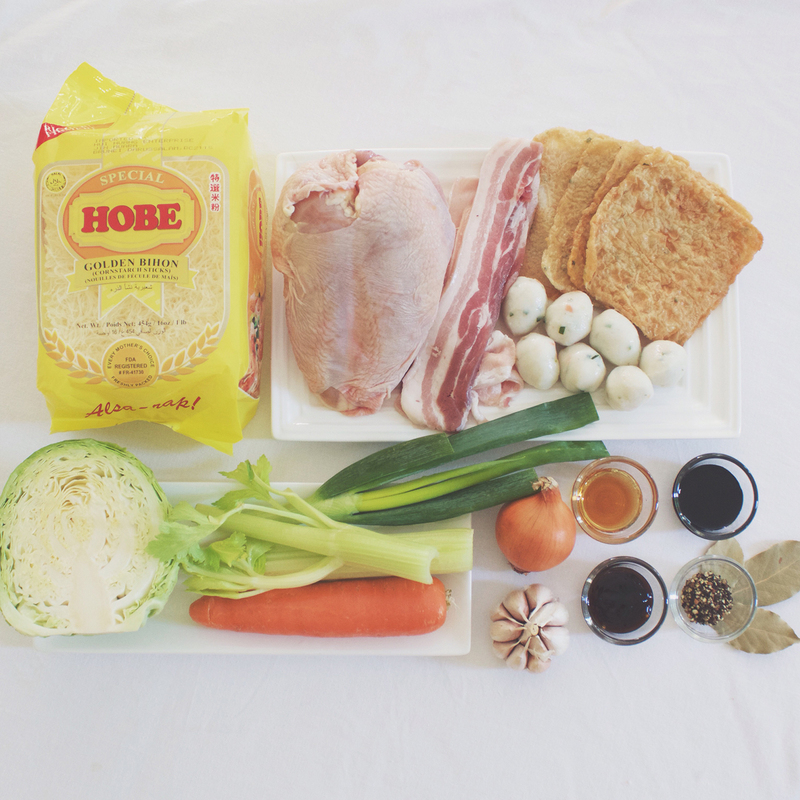 In the same frying pan, add the chicken stock to the pan together with the soy sauce, fish sauce, and oyster sauce. Bring to a boil. Once boiling, add the bihon noodles in and cook until all the liquid has evaporated. Make sure that while cooking, you mix and untangle them periodically. Altogether this should take about 10 minutes. Halfway through, add in half of the cooked meat and vegetables to the noodles and mix well. Serve immediately topped with the extra meat and vegetables, and with calamansi, or alternatively a lemon wedge. Enjoy! Halloween Special: Creepy Broken Glass Cupcakes!